Another iconic scene in Fremont, the Fine Arts Foundry founded by Peter Bevis in 1981. He originally conceived the 2-story concrete structure as a gathering place for artists, housing a number of studios, a gallery, stone carving yard, sculpture garden, darkroom, and offices. In 2013, after 10 years of vacancy, Dhruv Agarwal renovated the building for his business True Fabrications, which designs and sells a variety of wine, bar, and gift products. The building also incorporates a creative arts venue for product launches, company meetings, client events, and winery/brewery tastings. 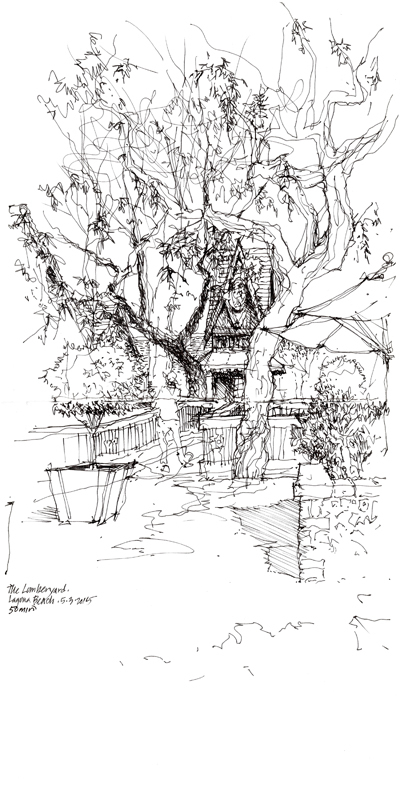 Last Sunday, the Seattle Urban Sketchers met at the Country Village in Bothell, a small community northwest of Seattle. Built around an original farm house from 1901, the complex comprises a layout of shops, offices, and restaurants set amid duck ponds, streams, and walking paths. There’s even a scaled-down train offering rides on a half-mile of track. This particular view attracted me because of the eclectic mix of elements—a caboose, a windmill, and a land-bound ship—all surrounding a pastoral pond foregrounded by tall grasses. After the Orange County workshop, Deb and I spent a day at the Getty Center, a campus of the Getty Museum in the Brentwood neighborhood of LA. The complex of galleries, library, offices, and research institute designed by Richard Meier is situated along two ridges of a hill in the Santa Monica Mountains. 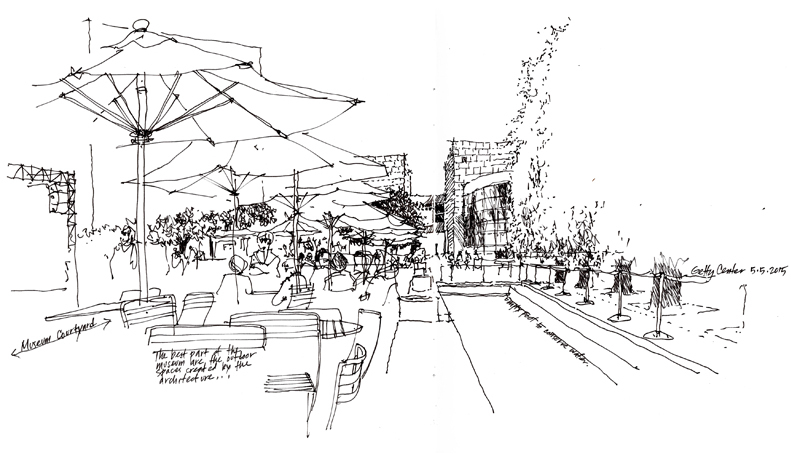 The architecture is striking, but as I noted on my sketch of the museum courtyard, the most attractive and enjoyable part of our visit were the landscaped open spaces and gardens created by the architecture. Notable is the Central Garden designed by artist Robert Irwin. 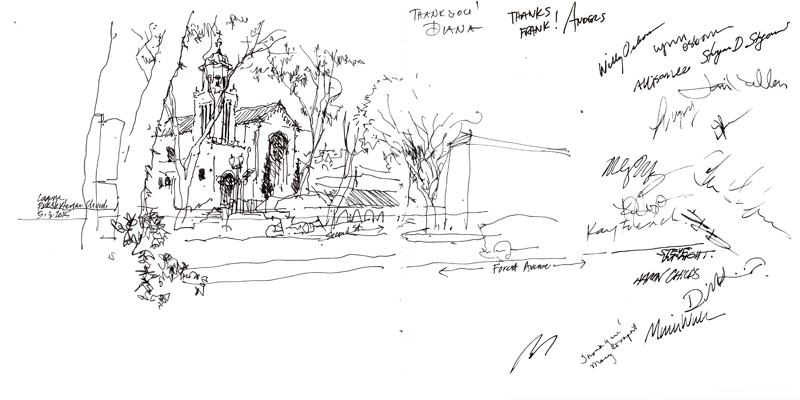 We spent two wonderful and gratifying days in Orange County last weekend, drawing at the Mission San Juan Capistrano, along the Laguna Beach promenade, and in the confines of the Lumberyard courtyard. 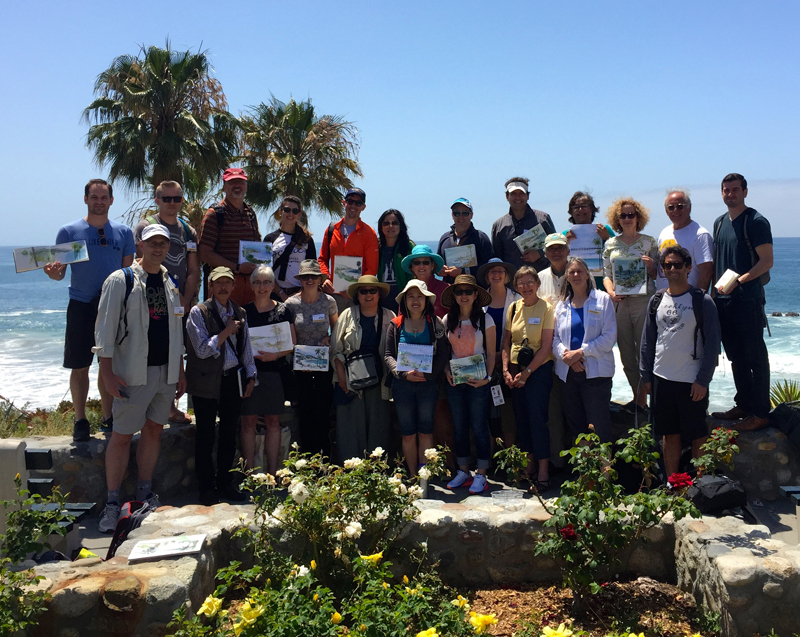 Thanks to all of the workshop participants for their enthusiasm, hard work, and high spirits. 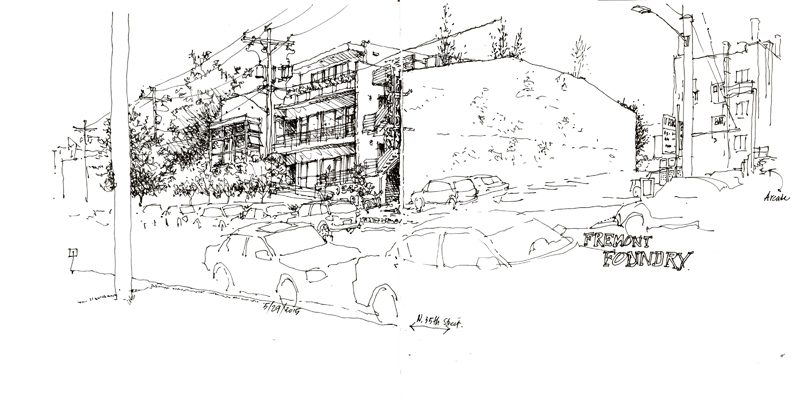 Despite the numerous books, and now videos, on sketching and drawing that are available, they cannot match the immediacy of hands-on teaching and learning. 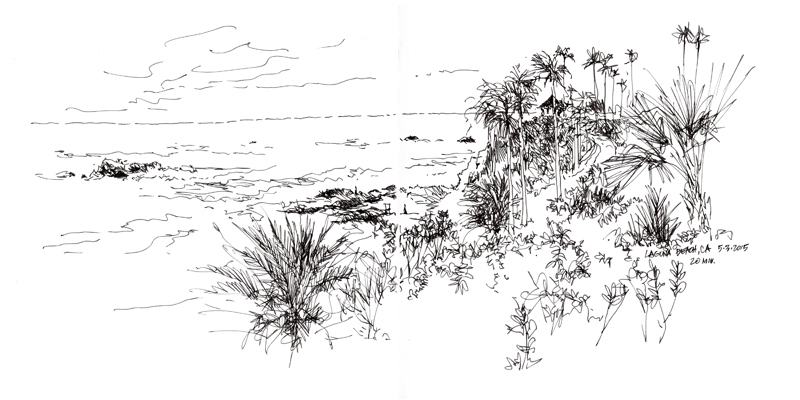 It is difficult to replicate the experience of standing or sitting side-by-side, looking out at the same scene, and discussing and demonstrating the ways of seeing that are crucial to on-location drawing. 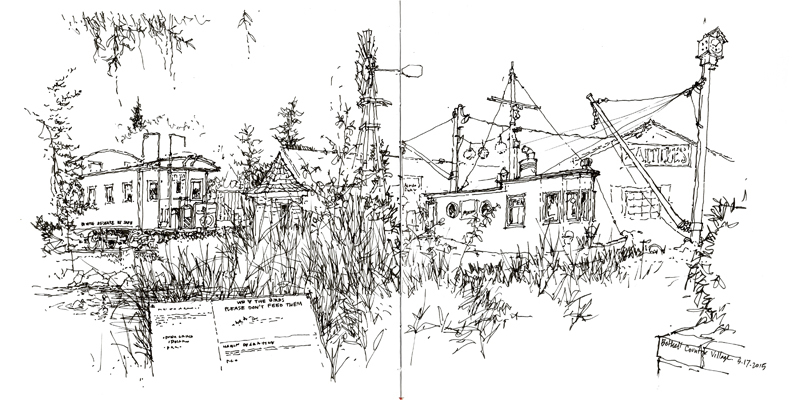 Urban Sketchers Singapore and Temasek Polytechnic are hosting the 6th International Urban Sketchers Symposium this year. There’s a great lineup of faculty and presenters who will be offering workshops, lectures, and other activities from the 22nd through the 25th of July. 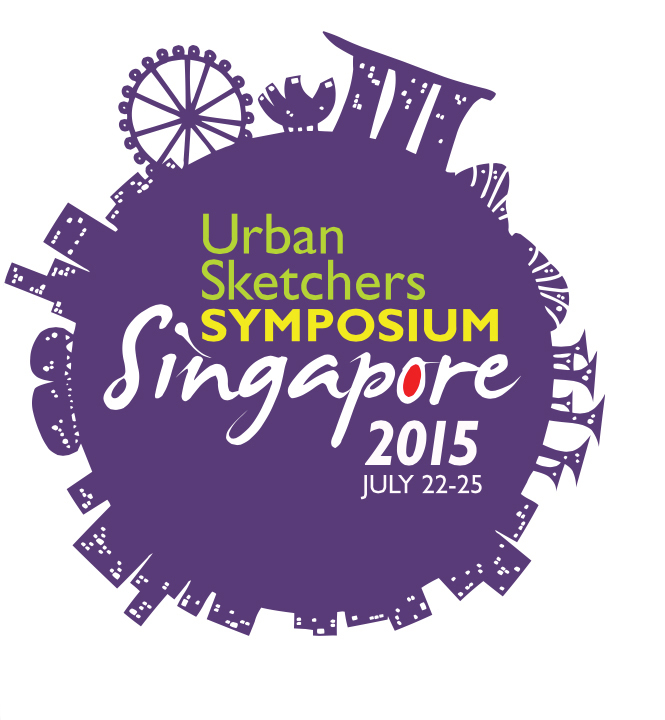 For more information about the schedule, programming, and registration information, please visit: <http://singapore2015.urbansketchers.org>.